Competition grip wax with high fluoro content. Fluoro is used because it maintains the properties of the wax much longer. 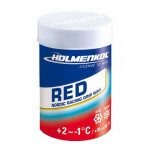 Developed for temperature range -2°C...-15°C. For use at high air humidity. 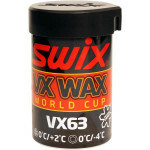 VX63 - high fluor grip wax of World Cup series. New fallen snow:+2ºC to 0ºC. Transformed fine grained snow: 0ºC to -4ºC. Highly fluorinated synthesis racing wax for ﬁne to coarse and wet snow. A fluorocarbon glider intended for cold winter temperatures. Recommended operating range: at less than 75% humidity, -1/-10°C. A special product for new and damp snow. Recommended operating range: at less than 75% humidity - 0/-3°C; at humidity over 75% - -1/-5°C. 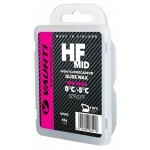 HF WET: is an excellent choice for base wax under fluorocarbon coatings in wet conditions. Suitable in mild winter condition, on old and coarse snow down to -3°C as long as there is high humidity in snow. 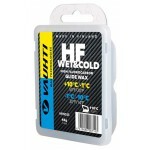 HF COLD: A fluorocarbon glider intended for cold winter temperatures. Recommended operating range: at less than 75% humidity - -1/-10°C; at humidity over 85% - -6/-13°C. Designed in particular for damp artificial and old snow conditions. Recommended operating range: at less than 75% humidity - +3/-3°C; at humidity over 75% - -1/-5°C.